Stanley E. PORTER, Andrew W. PITTS, (éd. ), Christian Origins and Greco-Roman Culture. Social and Literary Contexts for the NT. Early Christianity in its Hellenistic Context, vol. 1, Leyde/Boston, Brill, coll. « TENTS 9 », 2013. 24 cm. xii-752 p. ISBN 978-90-04-23416-1. € 210/US$ 292. Stanley E. PORTER, Andrew W. PITTS, (éd. ), Christian Origins and Hellenistic Judaism. Social and Literary Contexts for the New Testament. Early Christianity in its Hellenistic Context, vol. II, Leiden/Boston, Brill, coll. « TENTS 10 », 2013. 24 cm. xii-619 p. ISBN 978-90-04-23476-5. € 188/$US 261. David HAMIDOVIĆ, L’interminable fin du monde. Essai historique sur l’apocalyptique dans le judaïsme et le christianisme anciens, Paris, Cerf, coll. 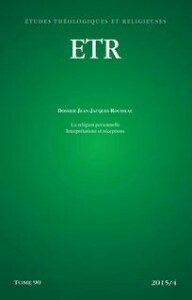 « Lire la Bible 185 », 2014. 21,5 cm.162 p. ISBN 978-2-204-10159-2. € 25. Julien M. OGEREAU, Paul’s Koinonia with the Philippians. A Socio-Historical Investigation of a Pauline Economic Partnership, Tübingen, Mohr Siebeck, coll. « WUNT II/377 », 2014. 23, 5 cm. xiv-592 p. ISBN 978-3-16-153488-1. € 99.